“We had the choice of three different suppliers for the system, the one that gave us the best service and the most robust solution was Axiom GB. It is a professional organisation which is both customer focused and business oriented. 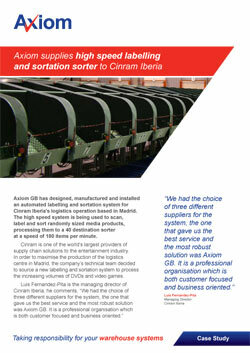 “Using the Axiom sortation and labelling system we can now work more profitably. Doing this type of work manually would be entirely unprofitable. We started using the system for just 20% of our orders and this has increased to 60%. In addition, it is now used for our reverse logistics service.